Since taking over as head coach of the UNH women's basketball team, Maureen Magarity has made it a priority to recruit in-state talent. This includes Marist transfer Katharine Fogarty (Peterborough, NH) and junior point guard Aliza Simpson (Londonderry, NH). Now, the Wildcats have received a commitment from another local recruit, as Amanda Torres (Hudson, NH). The 5-foot-7 Torres is an explosive point guard who is nearly unguardable off the dribble. Few players in the region are as good at penetrating into the lane and creating offense. It's been clear for awhile now that Torres was a scholarship player, it was just a matter of where she'd end up. "My decision to commit to UNH was a pretty easy choice for me" Torres told the NH Notebook. "During my visit I immediately felt comfortable and that I could have a very good future here. The team had a family atmosphere that I liked. Walking around campus and getting to know the coaches I felt like this could be my home for the next four years. I definitely liked the coaching staff a lot, they made me feel at home and were really welcoming." College coaches love this strategy. Recruit point guards that are three years apart. That way there's a 'bridge year' where they can play together, so the senior point guard can mentor the freshman, so the freshman isn't thrown into the fire with a ton of pressure on them. UNH will be able to do it with two extremely talented point guards in Simpson and Torres - who grew up the next town over from each other. It's a great story. "Having Aliza at UNH did play a role in my decision" Torres explained. "Growing up I would always hear people talking about Aliza and comparing the way we played saying they we were very similar. I have worked out with Aliza a couple times over the summer and we were friendly with each other and after my visit she messaged me talking about the school and everything and this is where it really sold to me. I think I will take a similar role to Aliza when she graduates." Torres chose UNH over the New York Institute of Technology, where last year's NHIAA D-I Player of the Year Meg Knollmeyer is now playing at. "I was mainly looking at UNH and NYIT" Torres pointed out. The thing that led me to pick UNH was definitely the feeling I got while being on campus and the coaches. Walking around campus I just felt like this could be home and I could really be happy here with academics and basketball." I've been telling people that Torres is a scholarship player for over two years now. It was especially clear as she put on a show in leading her Proctor Academy team to a NEPSAC Championship this past March. Yet after the game when I interviewed her, she told me she had yet to receive an offer. Torres' story just goes to show you that if you're good enough, college coaches will eventually notice - so if the offers aren't coming yet, stay positive. That's what Torres did. Now she's a D-I player. 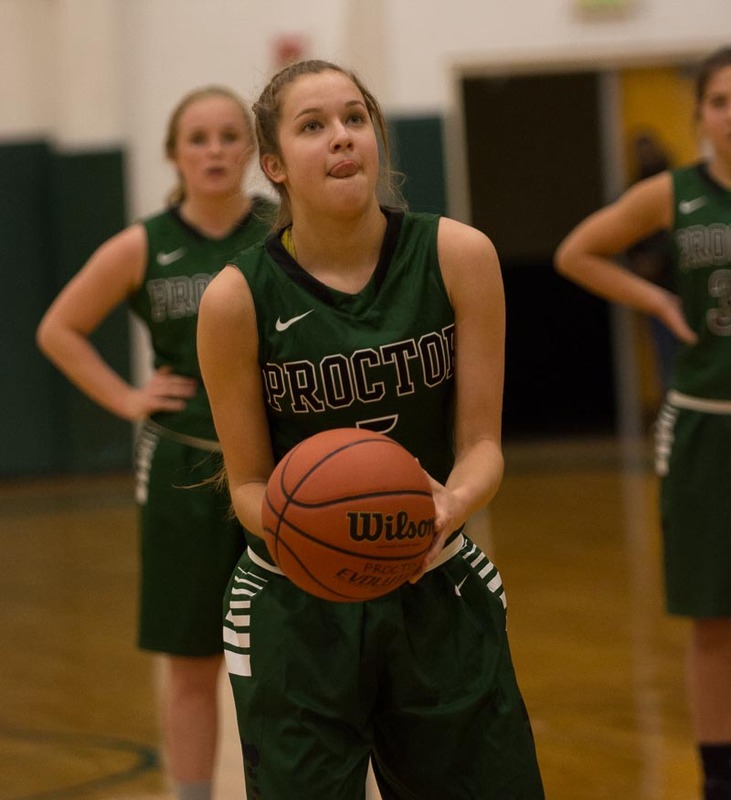 "Honestly, knowing all my hard work paid off is one of the best feelings I have experienced" said Torres, who transferred to Proctor following her sophomore year at Trinity High. "I have dreamed of playing D-I since I can remember and to know that I am that much closer to actually doing it is such an unbelievable feeling." Torres' talent was taken to the next level by playing at Proctor and on the AAU circuit with the Rivals Basketball Club. "Playing with the Rivals and Proctor have helped me greatly in becoming who I am today" mentioned Torres. "Training with TJ Thompson, Miguel Gonzales and playing for Scott Hazelton have helped me a lot. They all pushed me to be the best player I could be and believed in me. I learned a lot from all of them. Proctor has been a great experience. It has helped me grow as a person, I have learned so much from being here. I have had great support from the people at Proctor from the coaching staff and my advisor Kelly Griffin Brown. I could not thank my coaches Liz McNamara and Lindsay Brown enough for everything they have done for me. They were very supportive of me and pushed me a lot. They relied on me a lot and had confidence that I could be a role model on the court and lead the team. I am going to miss playing for Liz but am looking forward to play for Junior de la Hoz and Lindsay Brown. Rivals was also a great help, I got to play with some of my best friends and was able to make new friends and teammates and Scott Hazelton pushed me so much. Playing with the Rivals we play against high competition and I think this helped me grow as a stronger player emotionally and physical and I was able to take my game." The humble Torres also credits her success to a strong family upbringing, so it's no surprise that she's staying close to him by selecting UNH. "Also, the support that I received from my family especially my parents who have been a huge help" Torres concludes. "They always kept their faith in me and have driven hours and spent to much money just for me to get to this point and I can not thank them enough for doing what they do for me. The town of Hudson isn't necessarily known as a basketball powerhouse, but with Torres (UNH), Jamie Sherburne (Niagara), Tyler Livingston (UMass Lowell) and Caleb Donnelly (Northeastern) that's four D-I players its produced in the past few years. Time for Hudson to get more respect!